As much as I liked the beach, for example, I couldn't imagine myself retiring in my 50s and 60s and sipping cocktails while watching the sunset on a Caribbean island. I wanted to write, hike, spend time with friends, and possibly raise a family, but how those goals intersected with my finances didn't resonate with me; after all, I could do either whether I had empty pockets or an enormous portfolio. In addition, I couldn't fathom how my aspirations and financial goals might change as I grew older. My lack of narrowly defined and expertly crafted long term goals didn't stop me from saving or investing for basic financial goals — I just didn't have the alignment that planners craved. Still, thinking about how I've approached goal setting in the last few years, I realize that achieving short term goals can be crucial to reaching long term ones. Let me tell you about my 2016 goals and how they'll help me reach larger aspirations. Declutter (both digitally and in real life). Complete the development phase of a small group ministry. Write 100 articles for this website. Before tackling these tasks (particularly #1 and #2), I needed to accept it's unlikely that I'll achieve perfection on my first try. That doesn't mean I'll compromise on my commitment or dial back my effort. But it does mean I expect to learn from my early attempts, identify and address my weaknesses, and devise a more focused strategy for future projects. Having learned to overcome basic challenges of writing a book and gained confidence in my ability to see a lengthy project to completion, I resolved to continue my education in writing, publishing, and promoting books. On my second go-round, I believed I could discern and apply lessons more readily. This approach has already yielded benefits. For example, one of my struggles in my first attempt at book writing involved developing a consistent style among various chapters. I had followed the “just do it” (or rather the “just write it”) approach, which was helpful in preparing the first draft but troublesome in editing. As I edited my book, I realized that the writing and editing process could have progressed more smoothly if I had a model for each chapter. Later, while listening to a presentation given by Michael Hyatt, I happened upon the concept of developing a chapter template. Hyatt said that this one idea was “huge” and I agree. It seems obvious now, of course, based on my struggles but if I hadn't written the earlier book, I may have missed the value of this tip. Using a chapter template to achieve consistency will not only create structure and improve my speed but also enable me to direct the organizational editing of future books, which I plan to write (I'm working on one now). I'm also applying this give-it-a-go-and-improve-the-next-time approach to triathlon. In the past, I've hesitated to enter a half-ironman race because I know I have the potential to do well but lacked training time and acumen. I got stuck in a perpetual catch-22: I wanted to race to my full capabilities; but knowing how to train and race exceptionally requires experience competing in a long-distance triathlon. Finally, I decided just to sign up, race as well as possible, and, if I wanted to continue with the sport, refine my training methods and racing strategy for subsequent events. Both my previous successes and disappointments inspired this method of establishing goals. After looking at what worked and didn't work in the past, I noticed that generally I could achieve goals as long at they weren't dependent on outside happenings. For example, I did NOT set a goal to sell a certain number of books, achieve a certain ranking in the race, sell my excess stuff for a certain dollar amount, launch a certain number of small groups, generate a certain number of pageviews, etc. This process-oriented approach can be applied to achieving life goals in many categories. One way to apply this concept to financial goals is to set objectives based on actions, not market activity. For example, I might decide to save and invest $500 monthly for retirement this year, rather than set a goal to earn 10% investment returns. This approach wouldn't mean that I'm going to scrimp to sock away $500 and then plow the money into speculative ventures. Instead, it could involve investing according to a plan without pinning hopes on achieving a certain level of returns. The idea here is the I'll gauge my success based on intentional actions, not circumstances (like global economic growth and the S&P return) outside of my control. Eventually, I'll define the net worth and investment balances I'd like to achieve. But for now, I'll focus on the discipline of saving and investing. To an extent, this lesson is similar to the first one I mentioned. The difference is that for #1 and #2, I have a general idea of what I need to do to succeed. For other goals, I may be clueless. For example, last year I studied French using Rosetta Stone software in preparation for my trip to the Western European Alps, where French is widely spoken. My goal was to finish all levels (1 to 5) in a year's time. I didn't grasp the complexity of this goal. Moving through these various levels was much more difficult and time-consuming than anticipated. I struggled with the speaking lessons, often taking twice as long as the suggested timeframes. In addition, I couldn't extrapolate grammar rules based on general instruction as required in this teaching method. Though I improved my French language skills, I didn't come close to achieving my goal of completing all levels. I learned that goals associated with the unknown should be calibrated based on their newness. In this case, setting moderate objectives could have helped me succeed in the short term and design long term goals more intelligently. 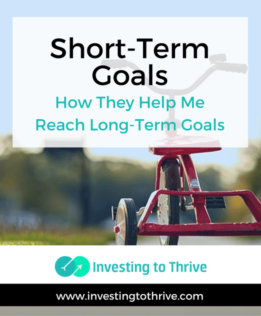 Setting goals — whether short term or long term — helps me focus my investments of time, effort, and money. I hope that reaching specific goals, like writing a first book and publishing a generous number of articles, will give me the direction I need to continue growing professionally. As Seth Godin wrote in his blog, “Nobody, even once, pops to the top.” Polishing and developing talent takes time. Short-term goals can be helpful if I know what I want to do this year, but am unsure of what I want to do (or can do) in 10, 20, or 30 years. In addition, the foundation of skills and knowledge gained from short term efforts can be stepping stones for pursuing larger and loftier ambitions. Love the perspective that short term goals can reveal weaknesses. I had not considered that.